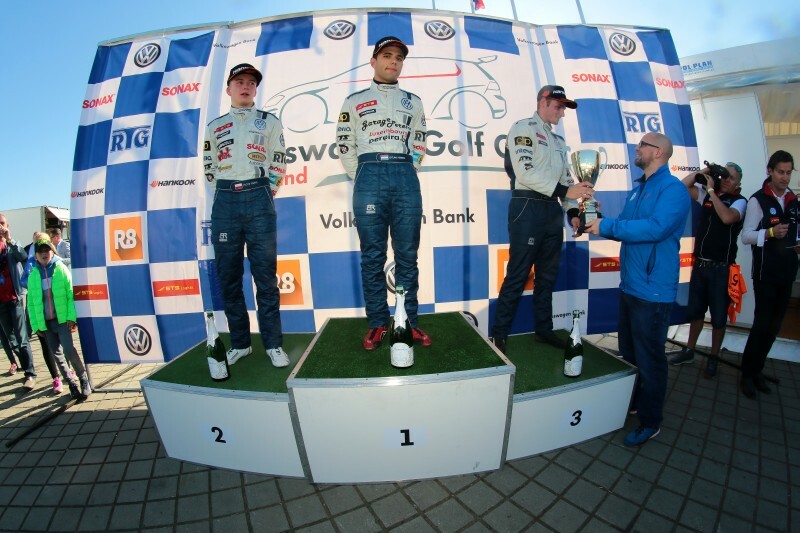 The main goal for Dylan Pereira during the final round of the Volkswagen Golf Cup is to become the king of the Tor Poznań. The driver from Luxembourg was the fastest during both practice sessions, reached the pole position with a great confidence and won the Saturday morning race, which was the penultimate battle of the season. The other drivers to finish in the top 3 were Piotr Parys and Jeffrey Kruger. The Saturday morning was once again quite cold, thanks to which drivers had to cover two formation laps, giving them an opportunity to heat up the tires before the wheel-to-wheel battle. When the lights went down the situation in the top didn’t change – Dylan Pereira was leading the race in front of Jeffrey Kruger, Piotr Parys and Simo Muhonen. The fourth lap was though the crucial one, as Parys managed to finalize a brave overtaking maneuver on the overall standings leader, jumping into the 2nd place. Later on, the red and white Golf GTI was very close to the rear bumper of Pereira, but the Polish driver was unable to attack the leader. What was really important, four laps before the end of the rivalry, Piotrek started to lose his pace and had to focus on defending his position, rather than attacking the leader. At the end of the day, Jeffrey Kruger was the last driver to cover the podium, finishing ahead of Simo Muhonen and Adam Rzepecki. Andre Gies crossed the finish line on the 6th place, overtaking Marucs Fluch who also lost his pace and had to defend his position, as Marcin Jaros was really flying and eager to overtake the Swede. The last drivers to finish in the top 10 were Sebastian Arriola and Jerzy Dudek. Today on the Tor Poznań we will witness the finale of the season, when precisely at 2:00 p.m. the second race will start. 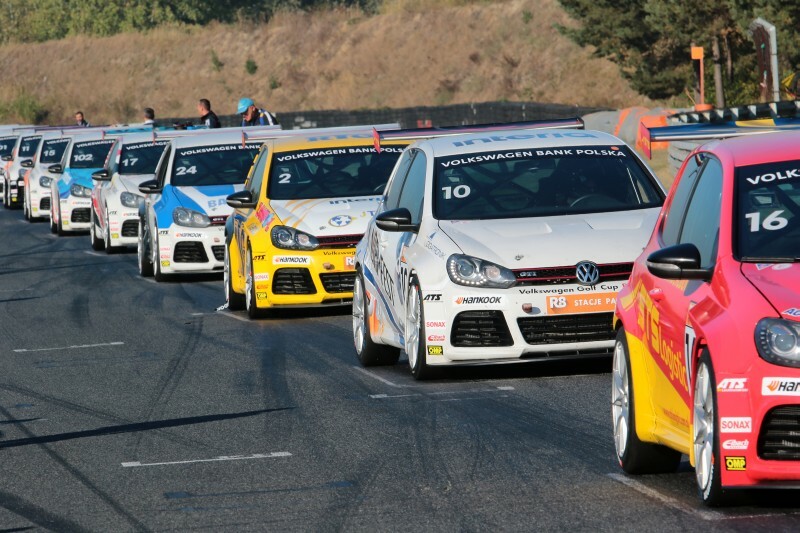 Half an hour later we will know, who is the new champion of the Volkswagen Golf Cup! Dylan Pereira: - The race was really great. On the first laps we fought hard with Jeffrey and I tried to keep my concentration and not to make any mistakes. When I saw Parys overtaking Kruger I knew it is a good information and I tried to control the rivalry and do my job. Jeffrey Kruger: - The race was quite well for me. At the beginning I fought with Dylan, but later on I did a mistake and let Piotr Parys overtake me. Later on he drove very well and I was unable to catch him, he really deserved this 2nd place. Congratulations to both him and Dylan, their drive was excellent. Piotr Parys: - I am really happy with how the first race went. I started well and was able to keep the good pace. Unfortunately, this wasn’t enough to beat Dylan Pereira. Afternoon we will fight in the second race and I hope the result will be at least that good.